Pursuant to Regulation (EC) No 1980/2000, a timely review has been carried out of the ecological criteria, as well as of the related assessment and verification requirements established by Commission Decision 2002/272/EC of 25 March 2002 establishing the ecological criteria for the award of the Community eco-label to hard floor coverings (2). Those ecological criteria and the related assessment and verification requirements are valid until 31 March 2010. In the light of that review, it is appropriate, in order to take account of scientific and market developments, to modify the title and definition of the product group and to establish new ecological criteria. Decision 2002/272/EC should therefore be replaced. A transitional period should be allowed for producers whose products have been awarded the eco-label for hard coverings based on the criteria contained in Decision 2002/272/EC, so that they have sufficient time to adapt their products to comply with the revised criteria and requirements. Producers should also be allowed to submit applications set out under the criteria set in Decision 2002/272/EC or set out under the criteria set in this Decision until the lapse of validity of that Decision. The product group ‘hard coverings’ shall comprise — for internal/external use, without any relevant structural function — natural stones, agglomerated stones, concrete paving units, terrazzo tiles, ceramic tiles and clay tiles. For hard coverings, the criteria can be applied both to floor and wall coverings, if the production process is identical and uses the same materials and manufacturing methods. In order to be awarded the Community eco-label for products falling within the product group hard coverings under Regulation (EC) No 1980/2000 (hereinafter the eco-label), a hard covering shall comply with the criteria set out in the Annex to this Decision. The ecological criteria for the product group ‘hard coverings’, as well as the related assessment and verification requirements, shall be valid for four years from the date of adoption of this Decision. For administrative purposes the code number assigned to the product group ‘hard coverings’ shall be ‘021’. 1. Applications for the eco-label for products falling within the product group hard covering submitted before the date of adoption of this Decision shall be evaluated in accordance with the conditions laid down in Decision 2002/272/EC. 2. Applications for the eco-label for products falling within the product group hard coverings submitted from the date of adoption of this Decision but by 31 March 2010 at the latest may be based either on the criteria set out in Decision 2002/272/EC or on the criteria set out in this Decision. 3. Where the eco-label is awarded on the basis of an application evaluated according to the criteria set out in Decision 2002/272/EC, that eco-label may be used for 12 months from the date of adoption of this Decision. (2) OJ L 94, 11.4.2002, p. 13.
information that will enable the consumer to use the product in an efficient way which minimises the whole environmental impact. The criteria are set at levels that promote the labelling of hard coverings that are produced with low environmental impact. This group can be divided into ‘natural products’ and ‘processed products’. ‘Natural products’ includes the natural stones, that, as defined by CEN TC 246 are pieces of naturally occurring rock, and include marble, granite and other natural stones. ‘Other’ natural stones refer to natural stones whose technical characteristics are on the whole different from those of marble and granite as defined by CEN/TC 246/N.237 EN 12670 ‘Natural stones — Terminology’. Generally, such stones do not readily take a mirror polish and are not always extracted by blocks: sandstone, quartzite, slate, tuff, schist. The group of ‘processed products’ can be further divided into hardened and fired products. Hardened products are agglomerated stones, concrete paving units and terrazzo tiles. Fired products are ceramic tiles and clay tiles. ‘Agglomerated stones’ are industrial products manufactured from a mixture of aggregates, mainly from natural stone grit, and a binder as defined by JWG 229/246 EN 14618. The grit is normally composed of marble and granite quarry granulate and the binder is made from artificial components as unsaturated polyester resin or hydraulic cement. This group includes also artificial stones and compacted marble. ‘Concrete paving units’ are products for outer floor-coverings obtained by mixing sands, gravel, cement, inorganic pigments and additives, and vibro-compression as defined by CEN/TC 178. This group also includes concrete flags and concrete tiles. ‘Terrazzo tiles’ are a suitably compacted element of uniform shape and thickness, which meets specific geometrical requirements as defined by CEN/TC 229. The tiles are single or dual-layered. The single-layered are tiles completely made of granulates or chipping of a suitable aggregate, embedded in grey and white cement and water. The dual-layered tiles are terrazzo tiles made up of the first face or wear layer (with single-layered composition) and a second layer, known as backing or base concrete layer, whose surface is not exposed during normal use and which may be partially removed. ‘Ceramic tiles’ are thin slabs from clays and/or other inorganic raw materials, such as feldspar and quartz as defined by CEN/TC 67. They are usually shaped by extruding or pressing at room temperature, dried and subsequently fired at temperatures sufficient to develop the required properties. Tiles can be glazed or unglazed, are non-combustible and generally unaffected by light. ‘Clay tiles’ are units which satisfy certain shape and dimensional requirements, used for the surface course of pavements and manufactured predominantly from clay or other materials, with or without additions as defined by CEN 178. Where possible, testing should be performed by appropriately accredited laboratories or laboratories that meet the general requirements expressed in standard EN ISO 17025. The competent bodies are recommended to take into account the implementation of recognised environmental management schemes, such as EMAS, ISO 14001 when assessing applications and monitoring compliance with the criteria (note: it is not required to implement such management schemes). The raw material extraction management for natural stones shall be ‘scored’ according to a matrix of six main indicators. The total score shall be based on the sum of individual scores given for each indicator, multiplied by a corrective weighting (W). Quarries must obtain a weighted score of at least 19 points to be eligible for the eco-label award. In addition, the score for each indicator must be higher or lower than the threshold specified, as appropriate. there shall be a waste water recovery closed system for avoiding sawing waste dispersion to the environment and to feed the recycling loop. Water shall be contained in close proximity to the place where it is used in quarrying operations and then it shall be conveyed by closed pipes to the suitable processing plant. After clearing, water shall be recycled. Assessment and verification: the applicant shall provide the calculation of their total ‘score’ (weighted accordingly), and related data for each of the six indicators (showing, amongst others, that each score is above the minimum score, if one is given) according to the matrix overleaf and to the associated instructions in the Technical appendix — A1. The applicant shall also provide appropriate documentation and/or declarations that prove compliance with all of the abovementioned criteria. Yearly limit value measured along the border of quarry area. Assessment and verification: the applicant shall provide appropriate documentation, including a map, of the land capability classification of the quarry site. Assessment and verification: the applicant shall provide a map and appropriate documentation to verify the population density of settlements lying within 5 km radius (distance) from the quarry border (authorised area). In the case of existing quarries and expanding settlements in the area concerned, the weight factor indicated in brackets shall be used. This does not refer to major extensions of the already authorised area of such quarries (> 75 %). W3. (weightings: 0,5) — If the quarry interferes with surface water bodies (average flow < 5 m3/s) there is a weight of 0,5 on both the indicators about water recycling ratio (I.1) and water quality (I.5). Assessment and verification: the applicant shall provide appropriate documentation to show whether or not there is any interference between the quarry and the surface water body. the declaration of conformity to Council Directive 92/43/EEC (2) (habitats) and Council Directive 79/409/EEC (3) (birds) (4). In areas outside the Community, a similar technical report is required to demonstrate compliance with the UN conservation on biological diversity (1992) and provide information on any national biodiversity strategy and action plan, if available. Assessment and verification: the applicant shall provide the related data and documents including a map of the area. If the extraction activity is not directly managed by the producers, the documentation shall always be requested to the extractor(s). as laid down in Council Directive 67/548/EEC (6) (Dangerous Substances Directive), and considering Directive 1999/45/EC of the European Parliament and of the Council (7) (Dangerous Preparations Directive), may be added to the raw materials. Alternatively, classification may be considered according to Regulation (EC) No 1272/2008 of the European Parliament and of the Council (8). In this case no substances or preparations may be added to the raw materials that are assigned, or may be assigned at the time of application, with and of the following hazard statements (or combinations thereof): H350, H340, H350i, H400, H410, H411, H412, H413, EUH059, H360F, H360D, H361f, H361d, H360FD, H361fd, H360Fd, H360Df, H341. Due to the environmental advantages of the recycling of materials, these criteria do not apply to the quota of closed-loop recycled materials (9) used by the process and as defined in Appendix A2. Assessment and verification: in terms of chemical and mineralogical analysis, the material formulation shall be provided by the applicant together with a declaration of compliance with the abovementioned criteria. Assessment and verification: in terms of chemical and mineralogical analysis, the material formulation shall be provided by the applicant together with a declaration of compliance with the abovementioned limits. No asbestos shall be present in the raw materials used for natural and processed products, as laid down in Council Directive 76/769/EEC (11). The use of polyester resins in the production shall be limited by 10 % of the total weight of raw materials. Assessment and verification: in terms of chemical and mineralogical analysis, the material formulation shall be provided by the applicant together with a declaration of compliance with the abovementioned requirements. Assessment and verification: the applicant shall provide the corresponding analysis and test reports for each emission parameter measured at all emission points. Where no test method is specified, or is mentioned as being for use in verification or monitoring, competent bodies should rely as appropriate on declarations and documentation provided by the applicant and/or independent verifications. The energy consumption shall be calculated as process energy requirement (PER) for agglomerated stones and terrazzo tiles or as energy requirement for firing (ERF) for ceramic tiles and clay tiles. Note: all the requirements are expressed in MJ per kg of final product ready to be sold. This criterion does not apply to concrete paving units. Assessment and verification: the applicant shall calculate the PER according to the Technical appendix — A4 instructions and provide the related results and supporting documentation. Note: requirement expressed in MJ per kg of final product ready to be sold. Assessment and verification: the applicant shall calculate the ERF according to the Technical appendix — A4 instructions and provide the related results and supporting documentation. Assessment and verification: the applicant shall provide the calculation of fresh water specific consumption as indicated in the Technical appendix — A5. For fresh water, only groundwater, shallow water or water from the aqueduct should be considered. The waste water produced by the processes included in the production chain shall reach a recycling ratio of at least 90 %. 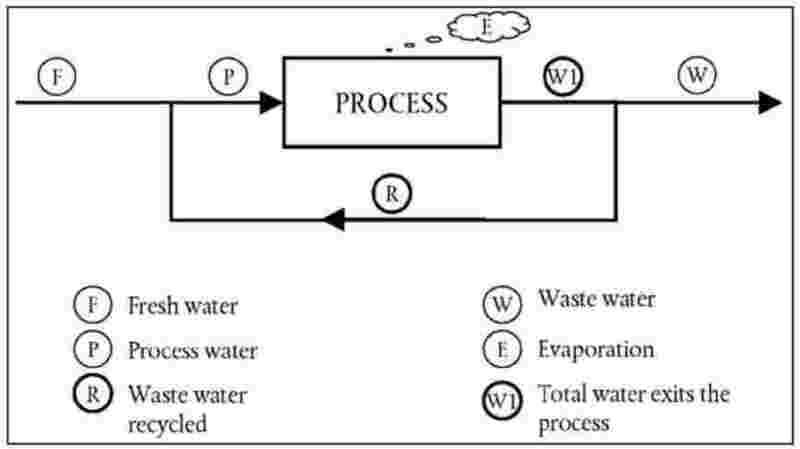 The recycling ratio shall be calculated as the ratio between the waste water recycled or recovered by applying a combination of process optimisation measures and process waste water treatment systems, internally or externally at the plant, and the total water that leaves the process, as defined in the Technical appendix — A3. Assessment and verification: the applicant shall provide the calculation of the recycling ratio including raw data on total wastewater produced, water recycled and the quantity and source of fresh water used in the process. Assessment and verification: the applicant shall provide appropriate documentation and test reports for each emission parameter mentioned above, following the indications of the Technical appendix — A6. Where no testing method is specified, or is mentioned as being for use in verification or monitoring, competent bodies should rely, as appropriate, on declarations and documentation provided by the applicant and/or independent verifications. The total emissions to air of particulates for pressing, glazing and spray drying (‘cold emissions’) shall not exceed 5 g/m2. Assessment and verification: the applicant shall provide appropriate documentation and test reports, following the indications of the Technical appendix — A6. Assessment and verification: the applicant shall provide appropriate documentation and test reports for each emission parameter mentioned above, following the indications of the Technical appendix — A6. The limits calculated in this way shall not exceed the limit values provided in the table. Assessment and verification: the applicant shall provide appropriate documentation and test reports showing compliance with this criterion. The use of raw materials for cement production shall be consistent with extraction management for processed products requirements (criterion 1.2). Assessment and verification: the applicant shall provide the relevant test reports and documentation related to the PER and the air emissions deriving from the cement production. procedures for handling and disposing of hazardous waste. Assessment and verification: the applicant shall provide appropriate documentation. The applicant shall provide appropriate documentation about waste management deriving from quarrying and from finishing operation. Waste management and the reuse of by-products (sawing included) have to be declared. Assessment and verification: the applicant shall provide a declaration of conformity with the requirement in accordance with the Directive 2006/21/EC of the European Parliament and of the Council (13). information about the reuse (internally or externally to the production process) of waste and secondary materials in the production of new products. At least 85 % (by weight) of the total waste generated by the process or the processes (14) shall be recovered according to the general terms and definitions established by Council Directive 75/442/EEC (15). Assessment and verification: the applicant shall provide appropriate documentation based on, for example, mass balance sheets and/or environmental reporting systems showing the rates of recovery achieved whether externally or internally, for example, by means of recycling, reuse or reclamation/regeneration. Assessment and verification: the applicant shall provide an analysis and test reports with regard to the emission parameters mentioned above. This shall include a declaration of conformity of the product with the requirements of Council Directive 89/106/EEC (16) and with relevant harmonised standards created by CEN once published in the Official Journal of the European Union. Paperboard used for the packaging of the final product should be designed for reuse or be made out of 70 % recycled materials. Assessment and verification: a sample of the product packaging shall be provided together with a corresponding declaration of compliance with all the requirements. The product shall be fit for use. This evidence may include data from appropriate ISO, CEN or equivalent test methods, such as national or in-house test procedures. An indication of the kind of use for which the product is fit for use has to be clearly specified: wall, floor or wall/floor if suitable for both purposes. Assessment and verification: details of the test procedures and results shall be provided, together with a declaration that the product is fit for use based on all other information about the best application by the end-user. According to Directive 89/106/EEC a product is presumed to be fit for use if it conforms to a harmonised standard, a European technical approval or a non-harmonised technical specification recognised at Community level. The EC conformity mark ‘CE’ for construction products provides producers with an attestation of conformity easily recognisable and may be considered as sufficient in this context. information on the Community eco-label and its related product groups, including the following text (or equivalent): ‘for more information visit the EU eco-label website: http://www.ecolabel.eu’. Assessment and verification: the applicant shall provide a sample of the packaging and/or texts enclosed. improved consumer information and waste management. (1) OJ L 327, 22.12.2000, p. 1. (5) Semi-processed products are balanced mixtures of different raw materials ready to be introduced in the production process. (6) OJ 196, 16.8.1967, p. 1. (7) OJ L 200, 30.7.1999, p. 1. (8) OJ L 353, 31.12.2008, p. 1. (9) ‘Close loop recycling’ means recycling a waste product into the same product. For secondary material arising from a manufacturing process (such as leftovers or remnants), ‘closed loop recycling’ means that the materials are used again in the same process. (10) Glazes are all the substances applied on the tiles surface between the tile shaping and the firing stage. (11) OJ L 262, 27.9.1976, p. 201. (12) The ‘Fe’ parameter is applicable to all the processed products ‘with the exclusion of ceramic tiles’. (13) OJ L 102, 11.4.2006, p. 15. (14) Process wastes do not include maintenance wastes, organic wastes and urban wastes produced by auxiliary and office activities. (15) OJ L 194, 25.7.1975, p. 39. (16) OJ L 40, 11.2.1989, p. 12. The applicant shall provide all the required information calculated, measured or tested for the period immediately before the application. Measurements shall be representative for the respective series of testing and it should be consistent for all parts of the application as appropriate. The expression ‘confined waterbed’ identifies an artesian waterbed. The average flow of the watercourse that interferes with the quarry shall be calculated taking into account the authorised area of the considered quarry. The calculation shall be made multiplying the section of the water body by the velocity of the water. The values shall be representative of at least 12 months. The calculation of I.2 consists of the measurement of the affected area, which includes quarry front and active dump areas, and of the authorised area. These areas should be measured during operating activities. The calculation of I.3 consists of the evaluation of the usable material and of the total volume extracted yearly. Usable material refers to all the volume which can be used in any process: for example, commercial blocks, aggregate materials, everything else suitable for further processing and use. This indicator is described in Council Directive 1999/30/EC (1). The calculation of I.4 consists of the measurement, along the border of quarry area, of PM 10 suspended particles based on the specific requirements of the test method and the general provisions of that Directive (PM 10 are defined in Article 2(11)). The test method is defined in EN 12341. This indicator considers the total emissions of suspended solids after treatment on surface water flowing out of the quarry site. The calculation of I.5 consists of the measurement of total suspended solids using the test method reported in ISO 5667-17. This indicator considers the noise level recorded along the border of the quarry area. Non-impulsive noises are to be measured. The calculation of I.6 consists in the measurement of the noise using the test method reported in ISO 1996-1. Class VIII soils and miscellaneous areas have limitations that preclude their use for commercial plant production and limit their use to recreation, wildlife, or water supply or for aesthetic purposes. ‘Closed loop recycling’ means recycling a waste product into the same kind of product; for ‘secondary material’ arising from a manufacturing process (such as leftovers or remnants), ‘closed loop recycling’ means that the materials are used again in the same process. The calculation of the water recycling ratio shall be consistent with the following formula based on the flows highlighted in Figure A1. For waste water is meant only the water used in processing plants, not comprehensive of the fresh water coming from rain and subsoil water. When providing a calculation of process energy requirement (PER) or energy requirement for firing (ERF), the correct energy carriers shall be taken into account for the entire plant or for the firing stage only. Gross calorific values (high heat value) of fuels shall be used to convert energy units to MJ (Table A1). In case of use of other fuels, the calorific value used for the calculation shall be mentioned. Electricity means net imported electricity coming from the grid and internal generation of electricity measured as electric power. Evaluation of PER for agglomerated stone production shall consider all energy flows entering the production plant both as fuels and electricity. Evaluation of PER for terrazzo tiles production must consider all energy flows entering the production plant both as fuels and electricity. Evaluation of ERF for ceramic tile production shall consider all energy flows entering all the kilns as fuels for the firing stage. Evaluation of ERF for clay tile production shall consider all energy flows entering all the kilns as fuels for the firing stage. Evaluation of PER for cement production shall consider all energy flows entering the production system both as fuels and electricity. water from aqueduct and intended for exclusive industrial use (excluding water form aqueduct for domestic use, irrigation and any other non-industrial use) in m3. The system boundaries are intended from raw materials to firing operation. the samplings shall be representative of the considered production. (1) OJ L 163, 29.6.1999, p. 41. (2) ‘W’ means the waste water discharged into the environment.